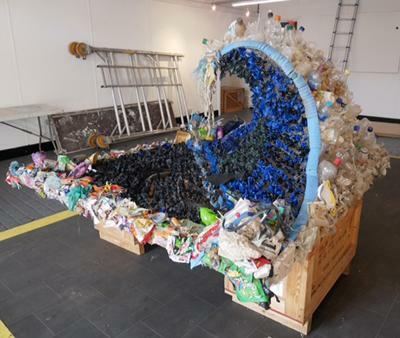 'Wave' by Jilly Evans is an art installation made from plastic rubbish pulled from Empress Dock, Southampton during the Spring of 2018. Empress Dock is home to the University's research vessel Callista and the rubbish was collected from the water by students. 'Wave' is the result of a collaboration between the School of Ocean and Earth Science at the University of Southampton and The Turner Sims. The sculpture uses wood and metal to support the plastic. It is 1,703cms x 1,703cms x 88cms. The purpose of the sculpture is to highlight the vast amount of non-biodegradable plastic currently in the world’s oceans. This plastic won't disappear; once it’s reached the sea there is nowhere else for it to go. 'Wave' can be seen at the University's Science of the Sea Experience at the 2018 Southampton Boat Show. Jilly Evans is a University of Southampton alumna. She graduated from Winchester School of Art in 2002 with a degree in Fine Art. Jilly was recently one of the artists in residence at God’s House Tower (a medieval building not far from the School of Ocean and Earth Science) working on the Arts Council funded project GHT-a reincarnation. Jilly's practice uses craft to make art to provoke thought. Instead of fabric, thread and yarn, her usual medium, she has used chicken wire, plastic and wood to make this installation. 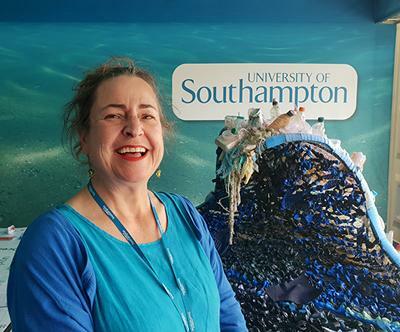 As well as working as a visual artist from her studio at the Arches in Southampton Jilly also works at Turner Sims, where she runs the Box Office for the University’s renowned concert hall and also curates regular exhibitions in the foyer.